The Tracy Holly Book Series is designated for free public access education. Please download any book available in audio or printable PDF format. Enjoy! 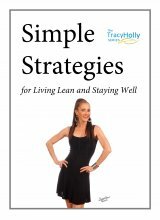 The series begins with Tracy's first book Simple Strategies for Living Lean and Staying Well. Read each digital book to supplement your existing knowledge and expand your personal awareness of holistic sports nutrition, health & fitness. Each eBook is in Adobe Acrobat digital format and is ideal for convenient reading on your computer screen, iPad or eReader. Each eBook can also be printed in color or black'&'white and read in the traditional manner.